Occult Rock Magazine: YOB: PORTLAND DOOM KINGS KICK OFF TOUR! 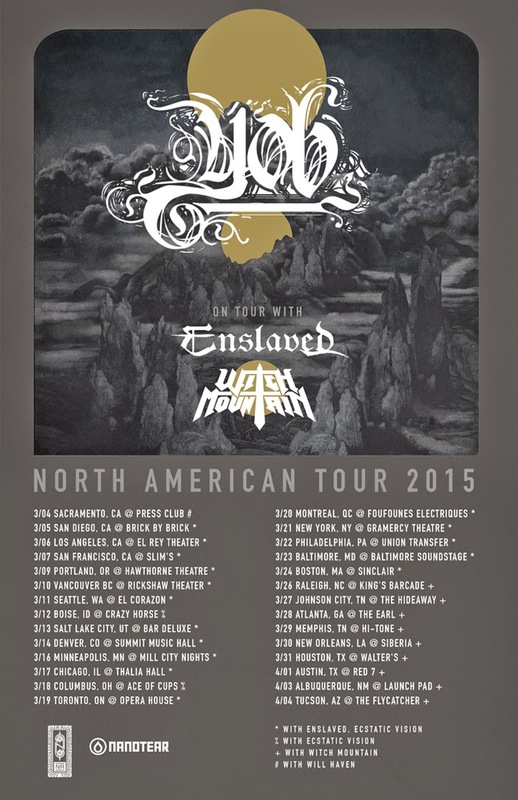 YOB: PORTLAND DOOM KINGS KICK OFF TOUR! Portland's most revered doom bringers, YOB, will return to the stage tomorrow for a mammoth North American run. The tour includes sixteen dates supporting progressive black metal technicians, Enslaved, as well as a batch of headlining shows scattered prior to, throughout and following the Enslaved run. See confirmed itinerary below. YOB will be touring in support of their critically-adored Clearing The Path To Ascend full-length, released early last Fall via Neurot Recordings. Recorded at Gung Ho Studio in Eugene alongside longtime YOB comrade/iconic sound wizard, Billy Barnett and mastered by Brad Boatright (Sleep, Beastmilk, Nails) at Audiosiege, Clearing The Path To Ascend has earned the praise of major media outlets globally, including Rolling Stone who placed the record at the coveted #1 spot on their 20 Best Metal Albums Of 2014.